You can find the menu by clicking on the hamburger icon (three horizontal bars) when you are on the camera screen. 2. 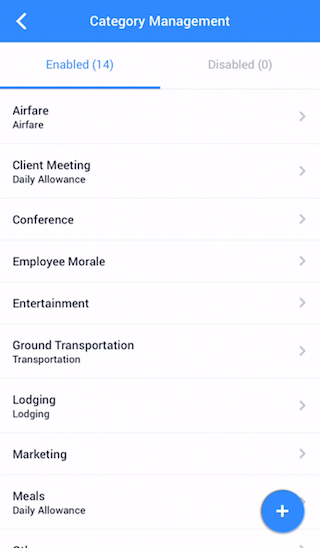 In the Company Settings page, select the Category Management option. 3. 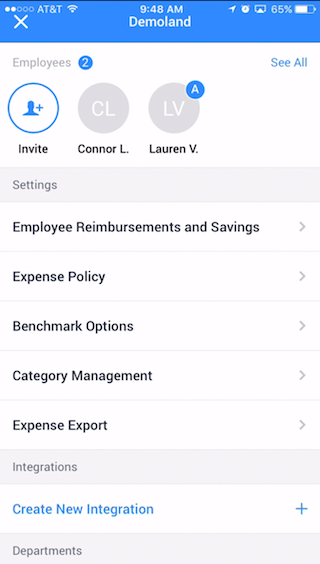 Select the expense category you wish to customize. 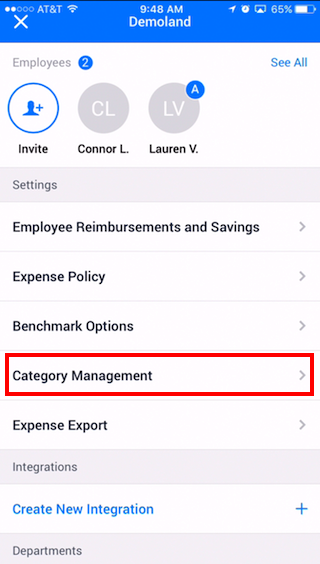 Once you are in the Category Management page, you will see the full list of pre-populated expense categories. Select the one(s) you wish to customize. You can enable/disable or rename any of the categories. If you have the general ledger integration enabled you can map each category to your chart of accounts. All expense categories are turned on (button to the left, in blue). To disable, click into the category you wish to edit and tap the "Enable" button. Certain expense categories are pre-mapped to Trip Budget categories, for a more in depth explanation of Budgets, click here.